Crossbars allow you to slide, swivel, and store your under-desk accessories on your adjustable height standing desk easily. The UPLIFT Desk Standard Crossbar End attaches lengthwise to desktops, connecting an UPLIFT desk base to the top. A standard frame end is 19.75" wide, ideal for desktops that are wider than 43". In need of replacement parts for a smaller desk, are converting a larger desktop to a smaller desktop, or want to create a gap underneath your desktop for a keyboard tray? You may want to consider the UPLIFT Desk Short Crossbar End instead. This part is compatible with both 2-leg and 3-leg UPLIFT desk bases. 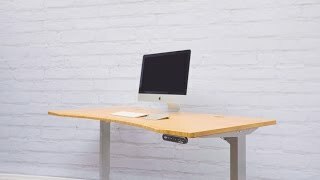 By installing Standard Crossbar Ends on your height adjustable desk, you give yourself the freedom to install a crossbar, which lets you mount accessories like CPU Holders underneath your desk. Improve your desk's space with a few simple under-desk additions! Will a Standard Crossbar End fit on my 3-leg desk? Yes, our Standard Crossbar Ends are designed to fit on all 2-leg and 3-leg UPLIFT Desk models. Does this come in one color? Nope, you'll get a trio of colors from which to choose to match your desk - black, gray, and white.